Hello again! Here's the next issue of 'Hyakunin Issho', which only took three months to get together (the first one took more than a year!). It looks like I'll be doing this on a quarterly basis from now on, introducing you to craftsmen involved with this project, and describing various aspects of the printmaking. That is, if I don't drive my wife crazy first with requests for translation assistance. She growls sometimes, but every time I put another one of my little articles on her desk, she always sets aside her regular medical translation work, and does mine. There's no way I could put out this little newsletter without her cooperation, and her help is much appreciated. This time we'll be taking a trip to Niigata Prefecture to meet the man who makes the blades for my carving knives. I'll also give some background on just why those little circles around the edge of this page are appearing in the particular order that they are, and there'll be the regular stories featuring print collectors, and telling about the origin of this project. I appreciate the kind comments that followed reception of the first issue, and I'll try hard to make this little newsletter an interesting adjunct to your growing collection of prints. Keep those cards and letters coming! It was no problem finding the Toyo Bunko, which is located near the famous Rikugien garden in Hon Komagome, Tokyo. I wasn't really expecting to be allowed to see the book, as I have not had much luck on previous attempts to get access to print collections. The Art Institute of Chicago, The Royal Ontario Museum in Toronto Canada, and both the Ota Museum and the National Museum here in Tokyo, have each 'shown me the door' when I made application to see some of their prints. They all ask the same question - 'What is your affiliation? ', and upon learning that I have no 'affiliation' (translation: no university degree), the interviews end abruptly. I encountered no such problem at the Toyo Bunko. The staff listened to my request, examined my little letter from the local librarian, and then gave me some kind of identification form to fill out. I was in! As I was not familiar with their cataloguing system, Mr. Koyama took the time to help me find the necessary catalogue numbers, etc. and then brought out the book for my examination. I was shown to a table, given the book, and then left alone to study it. I spent the next few hours leafing through the book, becoming familiar with Shunsho's work. I was struck again by what I had noticed in the small-size book illustrations back at the library, that it seemed as if Shunsho had tried to bring out some different aspect of each poet's character, quite a contrast to what I was familiar with in most Ukiyo-e work, where the faces are usually quite devoid of any personal expression. The more I studied this work, the more amazed I became that Shunsho is so little known these days. Everybody knows a few big names: Harunobu, Utamaro, Hokusai, etc., but nobody except the experts seems to have heard of Shunsho. Some of the people collecting my prints have said that they will be content with receiving only one year's set, 10 prints. Others however, are not only intent on acquiring all 100 in the series, but are impatient to have me get finished! Mr. Iwao Yamashita of Ome, the neighbouring town to us, is one of these people. He looks at a big empty space on his book-shelf and then starts counting my chickens (or tanuki skins, as the proverb goes in Japanese!). In the Japanese art world, printmaking usually takes a back seat to painting, and I doubt that there are many collectors of 'nihon-ga' among my customers. Yamashita-san though, is such a collector, with works by such well-known painters as Matsushita Kikuo, Kawai Gyokudo, and Tabuchi Toshio hanging on his walls. Occasionally when I visit him and his wife, they show me one of their latest acquisitions, and I enjoy being shown round their private 'in home' gallery. I am happy that they find my prints worthy of adding to their collection, and am pleased to be in such illustrious company! Yamashita-san is not just a customer of my prints but actually plays a part in getting them to your door. He is the president of a company making shipping containers, and it is from him that I purchase the material to make the package in which I mail the print to you each month. They don't normally sell material to such small customers, but he and his staff have been very helpful in supplying me with cardboard. My family and I are very thankful to Mr. and Mrs. Yamashita for the assistance they have offered us over the past year or so. They also help in more subtle ways. 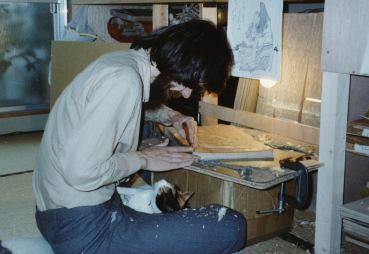 When I am sitting at my carving bench, I am very much aware of the fact that among my customers are people such as the Yamashitas, people with a collector's keen eye, who will be studying the finished prints closely. With such customers as these, I cannot allow any carelessness in the work, and I am forced to maintain the highest standards of which I am capable. We all benefit from his critical eye. 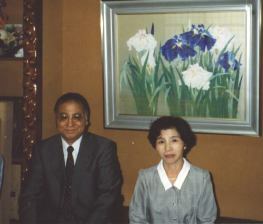 Mr. and Mrs. Yamashita - thank you for your support so far. To 100 together - let's go! The train came out of the long tunnel .... indeed, a much longer tunnel than Mr. Kawabata ever saw, and a much faster train than he ever rode. I was riding the Jo-etsu shinkansen, on my way to Niigata-ken to visit the workshop of Mr. Kinzaburo Usui, the craftsman who forges the blades for my carving knives. Unfortunately for my identification with the novel however, it was late May, and as I reached the village and made my way down the road towards his workshop, the only things that told me that I was in snow country were the sheds covering the sidewalk in front of the shops and the spray nozzles in the center of the road, which are used during the winter to make snow-plowing unnecessary. My visit to the block planer Mr. Shimano at his home in Tokyo's Shitamachi district a couple of months ago had been a journey backwards in a time machine. What would I find here, amid the famous Niigata rice fields, where the young, fresh green crop was just now poking above the surface of the shallow water? It is just before noon, and nobody answers my 'gomen kudasai' at the entrance to the workshop. I doubt that they can hear me. The very earth itself is shaking, as a giant mechanical hammer pounds on a bar of glowing metal in the gloom inside. I move towards it, and then see Usui-san there, standing between the mouth of the forge and the anvil upon which the huge hammer is repetitively falling. He is drawing incandescent bars of steel one by one from their fiery bed in the forge, and holding them on the anvil to be squeezed like pieces of child's playdough into the shape he wants. The thudding force of the machine dominates everything. It pounds and pounds in an unvarying rhythm, like some kind of infernal mechanical drum determined to beat its way deep into the earth. Usui-san looks up, nods a greeting, and then continues with his work. How can he endure this noise? At last the final bar comes from the forge, passes under the hammer, and is cast onto the floor to cool down in a pile with its predecessors. The hammer stops - but we still cannot speak. Although my eyes tell me that the room must have become silent, my brain cannot seem to believe it, and it is some time before we can converse. We make our way through the shop to a small reception room, passing as we go huge machines that dwarf the two of us, lined up one beside the other. I am basically familiar with forging and metalwork processes, yet I am unable to identify most of these tools. They are covered with control panels .. buttons .. video screens, and are obviously the latest products of Japanese factory automation technology. Later in the afternoon one of the workers will demonstrate some of them for me, and I will see rods of hard steel grasped, manipulated, and then sliced and carved completely automatically as easily as my wife handles a ripe daikon. I have indeed stepped into a time machine again, but this time I think I must have pressed the 'forward' button! Usui-san is very friendly, and we are soon deep in discussions of steel carbon content, annealing temperatures, and forging methods. 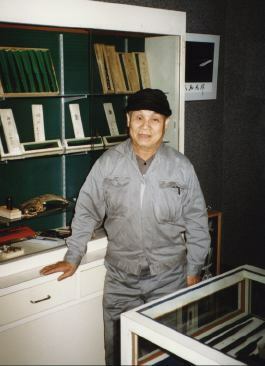 He is the third generation of his family working in this business, and has spent years of study developing his knowledge of metal forging processes. He drags out books filled with microscopic level photographs of different types of iron and steel, explaining to me just why it is that a specific amount of carbon must be present in the metal, and how it must be forged at just a particular temperature. There are no 'secrets' here, just deep knowledge acquired over many years of hands-on experience. He has done his homework well. The package of a few blades he sent me last year were an order of magnitude better than those I had been using from other makers. In ukiyo-e work, it is essential that the printmaker's knife be kept at the keenest possible edge for carving the thin lines, and as a result, I have worn these six blades down to small stubs. Usui-san brings out a small package ... another dozen of these beautiful blades. He gives them to me, along with a couple of larger chisels that I had requested. He will accept no payment. When I try and press the issue, he tells me that these are not really from their normal stock, and that they no longer consider themselves in the business of making this sort of tool. As is the case with pretty much every business in this country, they are desperately short of labour. Making these blades is very labour intensive, and he and his workers simply cannot afford to spend their time on products which are of interest to such a small (and poor) market. I have been thinking about this, and perhaps sometime in the future I will be back here, peering into the forge myself, trying to estimate the temperature of the steel by its cherry colour, and then hammering it to the shape and thickness that I want, under Usui-san's watchful eye. How about it, Mr. Usui? Do you think I could learn how to make these blades? If you can spare some time, I'd like to give it a try. Late in the afternoon, loaded down with his gifts and the memory of his hospitality, I make my way back to the station and am soon flying back towards Tokyo. These precious blades that I carry will gradually give up their life over the next year or so in the creation of the prints you are receiving. A large part of the appeal and character of these prints comes from the crispness and delicacy of the carving ... which comes from the sharpness and elasticity of the steel ... which in its turn, comes directly from Usui-san's deep knowledge of his craft. Usui-san, thank you very much. Many of the people collecting my prints have asked me about the order in which I am making them, and why I have changed the standard Hyakunin Isshu sequence. I started with Tenji Tenno, who is traditionally first, and I will finish with Juntoku In, number 100, but in between ....? The traditional Hyaku-nin Isshu numbering sequence is basically chronological, spanning the six centuries from the mid 600's to the early 1200's. I don't know if this order dates from the time of the compilation of the set (1200's) or from a later time, but it has now become pretty much immutable. Unfortunately for my purposes, it is not so interesting visually. For example, from #56 to #62 is a 'run' of seven female poets, three monks are bunched together in another place, there are eight emperors in the set, yet two of them are placed together right at the beginning, and another two right at the end. When I was planning this project, the idea of sending prints of seven women out to collectors on seven consecutive months seemed ridiculous. I thus examined the series and found that it is made up of 21 women and 79 men, broken down as follows: 20 court women, 8 emperors (one of whom is a woman), 13 monks, and 59 various other males (councillors, ministers of the crown, etc.). I conceived of the idea of splitting the 100 poets into groups of 10, and forming attractively balanced sets, each one making up a year's printmaking work. I prepared a small photocopy of each image, spread them out on the floor, and got to work. It fell into place beautifully. Of the 20 court ladies, two went into each set, and as Shunsho had posed 11 of the 20 standing, and 9 sitting, it was easy to make an appealing distribution. Every set got a monk, eight of the ten sets were graced with an emperor, and the remaining two sets each got an extra monk. Amazingly, I found that the 59 men (60 including the left-over monk) were also balanced, with 30 of them being seated, and 30 standing. I had a great time 'solving' the puzzle, and making up attractively balanced sets, studying many points in addition to the basic ones of male/female or standing/sitting. I considered: facing left/facing right, dark or light coloured kimono, a selection of seasonal colours, 'happy'/'sad' facial expressions, variations in kimono patterns, and also tried to include poems of each basic type, (love, solitude, seasonal, etc). It was impossible to balance everything, but I think that I eventually made up quite interesting sets of 10. I have samples here in my workshop pasted together in strips, one for each of the ten years, and I am quite pleased with the result. So my work is thus completely laid out until sometime near the end of Heisei 10 (1998). I'm sorry that I cannot respond to your requests to make your favorite poet 'next month, please' (as one nice lady did recently), but if you can just wait patiently, I'll get it to you sooner or later. Luckily for me, with 12 months in each year and 'only' 10 prints to make, I have a bit of leeway in which to handle unforseen circumstances as they arise. On the other hand, if things go well, perhaps there will even be time for some vacations! As for questions on whether or not I'm bored with this yet, I simply have to laugh. Each month brings a new challenge, and as long as I can feel an improvement each time, there's no possible chance of losing interest. By the time I reach number 100, I hope to be at the level where I can call myself a 'shokunin'. I'm really looking forward to the big party in December 1998, and you're all invited (I don't quite know yet where it will be held, but I'll keep you posted!). Until then, please enjoy your prints, keep your comments and criticism coming, and don't hesitate to come and see us when you're nearby!